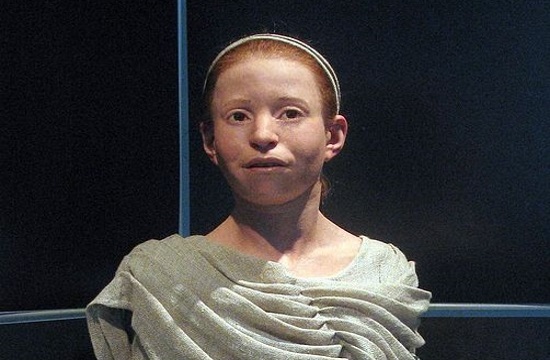 An 18-year-old girl who lived in Greece 7,000 years ago and was unearthed by archaeologists in Theopetra cave, near the city of Trikala, has had her face reconstructed and is about to officially introduce herself to the public. Eight years after the revelation of Myrtis, the reconstructed head of a girl that once lived in Classical-era ancient Athens and died during the plague in Athens in the 5th century BC and following the international sensation that it caused, the Acropolis museum is ready to to introduce Dawn’s new face from an even earlier past, to Greek and international audiences. Dawn (Avgi in Greek) is a woman from the Mesolithic era (7,000 BC) who lived in the Theopetra cave, according to Athens University professor Manolis Papagrigorakis; who has invested a great deal of time and learning in order to bring Greeks “face to face” with their ancestors. In a feature for the Athens-Macedonian News Agency (ANA) magazine "To Praktoreio", professor Papagrigorakis revealed that his interest in reconstructions stemmed from observing the faces of people or statues and noting jaw structure. The reconstruction of Avgi's face involved several medical specialties, he said, including an endocrinologist, an orthopedic, a neurologist, a pathologist and a radiologist. After a request by archaeologist Efi Baziotopoulou-Valavani, Papagrigorakis explained his team researched the cause of the plague that decimated Athens in 430 BC (during the Peloponnesian War) from ancient DNA, with the help of a Greek dentist/biologist/geneticist. In 2006 the team established that the cause of the plague was typhoid fever, he said. "Myrtis" was found in a mass grave from the era. The team has collaborated with Swedish sculptor Oscar Nilsson, whose studio specializes on historical body reconstructions. Dawn was discovered by archaeologist Nina Kyparissi-Apostolika and had a more wild form than Myrtis, given her era. Her facial reconstruction (her clothes and hair especially) was full of problems, given the lack of substantial evidence. Her discovery and reconstruction are expected to greatly enhance current understanding of Greece’s history and culture. Her “unveiling” will come as part of the seminar “Dawn at the Dawn of Civilisation”, to take place on January 19 2018, at the Acropolis Museum’s amphitheatre, open to the public and at no extra charge. She was named after "the Dawn of civilization", as the woman whose skull provided the basis for the reconstruction lived at the time human beings transitioned from food collectors to food cultivators. Papagrigorakis' team is also working on the reconstruction of the skull of a girl from Feres in Magnesia prefecture who was about 5.5 years old when she died in the 5th century BC. Her remains were discovered at an unlooted marble tomb, and she has been named Idyle. Finally, another of the team's projects includes the reconstruction of a "microbial map" of Classical-era Greece.